Narrative (https://pixabay.com/en/narrative-history-dream-tell-794978/) by Jonny Lindner (https://pixabay.com/en/users/Comfreak-51581/) is in the public domain (https://creativecommons.org/publicdomain/zero/1.0/). 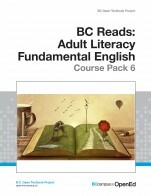 BC Reads: Adult Literacy Fundamental English - Course Pack 6 by Shantel Ivits, Vancouver Community College is licensed under a Creative Commons Attribution 4.0 International License, except where otherwise noted. 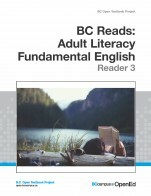 The text and course package for the BC Reads: Adult Literacy Fundamental English - Reader 6 is a very comprehensive package that includes writing, reading, vocabulary and grammar. I thought that the main idea would be to focus on the digital story, but there are ample paragraph writing assignments throughout the book, even a business letter. The author was correct to say it was about the journey, not the end story. Everything is well-coordinated around a digital story example for each chapter, and the students are encouraged to reflect on intent and purpose behind the stories. I do really like the variety of paragraph hand-outs that are included with the course package. The student would be exposed to a number of different ways to structure a paragraph or the story and should be able to use those methods again for future writings. I also like the way each chapter deals with a different type of paragraph: descriptive, expository or how-to, the narrative or storytelling, and the persuasive (such as opinion, argument, advantages or disadvantages). 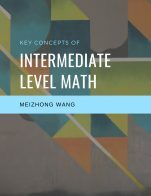 Although, there is not much work or explanation on introductory sentences, transition words, and conclusions, it is a Level 6 textbook aimed at higher level fundamental students. The reading comprehension sections are minimal, based on text readings about storytelling. However, topics such as insights, inferences, and opinions are examined to help provide awareness and comprehension. Students are encouraged in numerous ways to reflect on the deeper meanings and purposes within the stories. The grammar sections are short and more practice may be needed for some students. 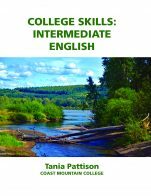 The grammar could be thought of as a concise review of fundamental skills for the advanced student who has had grammar at the lower levels. Vocabulary is also included in a "search the readings" for the right word method. There is a lot of variety in the teaching approach and the students should enjoy the work. The text has an index and a glossary. I find the bookmarks useful in the pdf but could use chapter numbers on the index and in the bookmarks. It is useful when referring to a section with a student. I would also like to see an indented sub-section of bookmarks under each chapter so that, for example, it would be possible to go right to the writing assignment for “Setting the Tone”. I find when I scroll through a digital copy I tend to go too quickly and pass what I am looking for. I wonder though if the students will use the glossary, and maybe it would be more useful to ask the students to fill in a word, a meaning or alphabetize the glossary. All in all, I think that Shantel Ivits did a wonderful job coordinating all the aspects in this book and she has even had to provide computer instruction on various topics. I do like the topic and the focus on digital storytelling. It has so much potential to be very rewarding to the student. The content is good and provides enthusiasm for the subject of storytelling. There was on link error that I came across to the storycenter.org for ethical practices. I did find it on the site so they may have reorganized. The only thing I found with the content was that most stories were sad and based on difficult trials in life. I think that lessons can be learned by good stories too and the content could be switched up a bit to include those other aspects of life that teach us things. The ethical statements advise how the topics should not be of a counseling nature, yet some of the stories chosen get close to vulnerable issues, and students may think that this should be the mood of their text and concentrate on problems. Later, some may be sorry that they shared. There does seem to be a heavy emphasis on HIV and LGBT issues, but that is an issue that needs promoting, especially because of the bullying in schools. https://www.youtube.com/watch?v=eDJuQsu2JmQ, Hooksum: A Digital Story by Josh Charleson A local Vancouver Island first nation story about a new kind of school. https://www.youtube.com/watch?v=PTlI5ahK-eA, Pulling Together: A Digital Story by Damon Rampanen. First Nations BC Story about a traditional canoe experience. https://www.youtube.com/watch?v=dOSrdXRBQiM I always wanted a cat - a digital story by Catherine "Cat" Wood Story of a woman who fosters cats. https://www.youtube.com/watch?v=rJ2WzBAcOnM "My Passion, Photography: A Digital Story" by Kelsey Krach Lots of people have enriched lives due to passions and hobbies. For sure, the computer info will have to be updated over time- or someone might find that Wevideo is not as good as another storytelling platform in the future and wish to update the information. Perhaps all the computer information could be on a separate link as the pdf probably cannot be updated. Links always change too and there are quite a few links in the text and package. Maybe Youtube is more stable for links? Yes, the text is readable and interesting. The author explains the word "queer" but does not define how it has re-evolved and has been reclaimed over the past few years to become an expression of gay activism and a broader definition of what it is to be LGBT. Yes, it is still to be used with care, but the author should add that it is now being promoted as a word of pride. The text is well coordinated with stories, assignments, and activities. At times, there is a link to a separate document that could instead be included in the Appendix. Having a separate online link might prevent some students from working at home. Yes, they have to watch the video, but that could be done on a phone. The text and package are well organized but as I said earlier, the chapters could be numbered and more bookmarks for the topics in each chapter added. This would provide much easier access for someone trying to find something. - oh yes, and if this was done, then a hand-out on using Adobe pdf might be useful too: finding and using the bookmark section, increasing or decreasing the document view, using sticky notes and the highlighter, saving, and printing just a certain page or pages. The text seems to be organized well. It is easy to go back and forth from text to the package by following the various sections. I used mostly the pdf version, but when I used the online version, many of the links opened the link in the same window. This made it necessary to use the back button and of course, it did go back to the place where I had been in the text. If the links would open in a new window, this would be resolved. Just as previously mentioned for the last question about the links in the online version opening to the same window instead of a new window. .
Also link to ethical practice for storycenter.org. did not go the right page. Looked great! - I did not notice any errors. More First Nation storytelling examples would be nice. And also information on using digital storytelling to tell old stories (if the appropriate permission is granted). It could also be used to promote language acquisition - First Nation language, spoken with voice, and told in pictures. For the deaf student, I have looked at Wevideo and it appears that you can do layers - so perhaps one can have a video (of student signing) and a picture on the same screen? I would be interested to see how this might work for the deaf students. It is so important that they are included. I just did a power point story with a deaf student, and it would be great to have more options. Canadian content: most of the stories are from the States and there is map of the USA to locate the stories. There definitely could be more Canadian content in this book. Another comment that I would like to make is that since there is so much computer content, it could be enhanced slightly, and maybe it could be offered for dual credit. - computer studies and English. 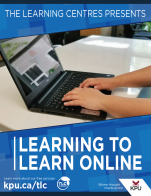 There already are topics such as file management, email, Internet search, uploading documents, picture manipulation and resizing, scanning, printing, and paragraphs and stories written on Word for the writing assignments. This text covers all areas and ideas of the topics appropriately. It would be helpful for students and teachers if it had an index and a glossary. Other levels do have a glossary, so it is confusing for students that this is inconsistent. The absence of an index and a glossary make for a lot of flipping through the pages looking for something in particular. The Level 6 scope and sequence provided in the appendix is a very helpful reference for teachers and should be reviewed in the planning stages. None of the material/topics in the Course Pack 6 are particularly dated. As it is available electronically and therefore printed as needed it will be very easy to implement updates. The language use is fitting for the level and appropriate vocabulary from the reading is pre-taught effectively in each unit. The text is internally consistent, but there are variations from other levels in the series which can cause some confusion for instructors and possibly for students if they work their way through the levels. Mostly this in the use/lack of use of unit numbers and location of the graphic organizers. In this book the graphic organizers are provided in the appendix whereas in other levels they are not and need to be located online. This text is divided into sections each with its own grammar point, vocabulary building and writing practice to go with the unit's reading. These units are a progression toward a final project so it is best worked through in order. As an instructor it was easy to provide supplementary materials to the units, but not to re-organize the order of the content and skills covered. The topics in the text are presented in a logical, clear way. The students easily learn the sequence of each reading and follow the progression through activating background knowledge, pre-teaching of vocabulary, reading and then post-reading grammar and writing. The interface is the weak point of this text. The lack of unit/chapter numbers and section numbers within the unit/chapter makes it difficult to look for specific items and to correlate the answer key to the exercises. It also takes away the ease of using the links in the electronic version of the text. My students work in a printed copy of the book. When they come to a link for a video, they then have to go to the electronic version of the text to follow the link. Despite the table of contents, this involves a lot of scanning through the material to the link. Another issue is with lack of section breaks within chapters in the printed version of the text. A single line will be bumped to the next page causing students to miss the last question of a task. I have not encountered any errors. This text includes the stories of a variety of individuals from diverse backgrounds. I do recommend this text. Overall the students were engaged in the materials and their skills improved in the targeted areas.